Up to $100,000 for each violation. Criminal penalties may include up to five years in prison. Why switch from your current office shredder? Is recycling my paperwork good enough? Do I really need an information security and document destruction plan? What about the records I have under lock and key? Aren't they safe? What types of information should be destroyed? What types of documents contain this information? 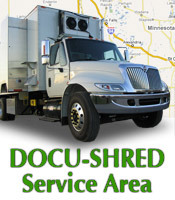 We provide the highest level of security with our on-site shredding service and locked containers. 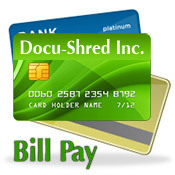 We never handle your confidential information as they are fed automatically into the shredder. Shredding on site insures that the opportunity for information theft is drastically reduced. Allows the customer to audit our service at any time. -Scheduled or bulk clean out services. We can help your business with a scheduled service tailored to your needs or a bulk clean out to get rid of those old records you no longer need. employment criminal background check and drug screening. To maintain their certifications they must submit to random drug testing as well as comply with our appearance and behavior standards which include uniform and photo identification badge. We are insured and bonded to provide your business peace of mind and we accept the	liability for your destroyed documents in case the unthinkable happens. Q: Why should we switch from our current office shredder? A: A high end typical office shredder can handle approximately 20-25 lbs. of paper in an hour. If you were to destroy 400 lbs. (standard 4-drawer file cabinet full) of documents, it would take an employee 15-20 hours to complete the task. When our truck shows up we can do the same job in under ten minutes. Your employee can get back to doing what is really important -- working for you. Q: Is recycling my paperwork good enough? Q: Do I really need an information security and document destruction plan? Q: What about the records I have under lock and key? They should be safe. Q: What types of information should be destroyed? Q: What types of documents contain this information?